Orthotics for Flat Feet- Quick Relief? "Could a pair of orthotics really relieve my discomfort?". 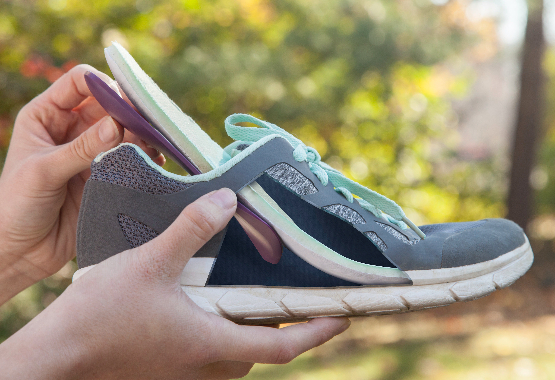 This is one of the most common questions asked by people with flat feet. Unfortunately, a simple "yes" or "no" answer is often difficult to give in this situation. Many factors can determine if orthotics can relieve the symptoms associated with flat feet, such as arch and heel pain. It is first important to understand what "flat feet" are, and what is the root cause of the discomfort associated with them. Flat feet are often referred to as "fallen arches", and is a common condition seen in both children and adults. 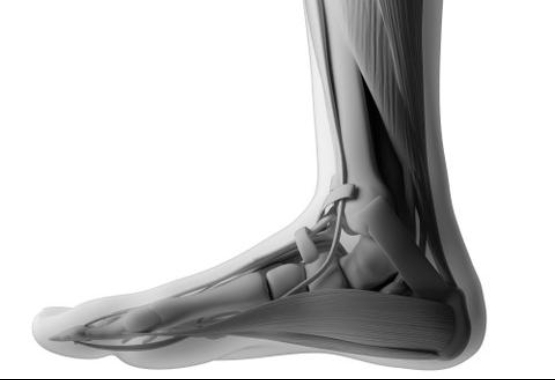 The arch of the foot is formed by a group of tendons and ligaments attached to the heel and foot bones. Tendons in the lower leg and foot must work in conjunction, pulling at the correct times during standing and walking. This aids in forming the arch of the foot. If the tendons do not pull sufficiently enough, or the ligaments of the foot are lax, the foot may be left with a very low arch, or no arch at all. This condition is commonly referred to as flat feet. This lack of internal arch support can cause a variety of problematic complications. In people with flat feet, the standard pressure of gait (walking), or standing, must shift to other portions of the feet that are not designed to handle this type of strain. If left untreated this can cause pain, discomfort, and possibly joint and soft tissue injury. The risks of developing progressive chronic flat feet can also increase with obesity, pregnancy, diabetes, and aging. It is very common for individuals with flat feet to experience discomfort, and sometimes significant pain. This is most commonly manifested as heel pain and arch pain. This may radiate to the ball of the foot as well. Activities such as prolonged standing and walking may be uncomfortable for a person suffering from collapsed arches. There is commonly significant strain on other portions of the foot , as well as restrained proper foot movement. Flat feet have long been suspected in contributing to foot and ankle arthritis, as well as leg, hip and back pain. Purchasing appropriate shoes that stabilize the heel bone and support the arch of the foot. Be aware that your new shoes should be able to accomodate an orthotic device if one were eventually prescribed for you by your podiatrist. A quality running shoe with a removable insole/liner will often be adequate. Using custom-made or over the counter orthotics to control the flattening of the arch while standing, walking and running. Walking in the correct shoes, and possibly using over the counter or custom orthotics, may be greatly beneficial in controlling and preventing pain and discomfort. Your podiatrist or physical therapist can often suggest strengthening exercises, and suitable stretches, to prep your feet for increasingly strenuous activity. Please note that effectively treating other conditions that can cause flat feet to become symptomatic, such as diabetes or obesity, is crucial to the long term success of treatment. In some cases it may be beneficial to avoid strenuous activities and high-impact sports. If over the counter orthotics have been tried and are not effective in reducing the symptoms associated with flat feet, custom orthotic devices may be fabricated by a podiatrist or pedorthist. How Do I Pick the Right Over the Counter Orthotic for Flat Feet? It is important to choose an orthotic that is not too rigid. When force is applied to an overly rigid device, the design of the insole or its material may not compress adequately. This transmits the shock generated from your foot striking the ground into the joints of your body. This will commonly lead to ankle, knee and back discomfort. Don't pick an orthotic that is too "cushiony". A flimsy or squishy orthotic may be comfortable at first, but devices such as these often fail to provide adequate support for the arches of the feet. They often are not effective in alleviating the symptoms caused by flat feet. For many years it has been a common practice for over the counter orthotics to be sold by "approximate sizing". This can lead to poor support, and an inadequate fit, for many users. Many people may be "in between" sizes for the large majority of insoles on the market, leading them to believe that an over the counter orthotic may not be effective for them. Therefore, it is imperative to confirm that any orthotic you purchase fits your foot and arch appropriately, regardless of the manufactures' suggested sizing. Podiatrists can often fabricate a custom orthotic that is specifically designed for your foot and your condition. They can also aid you in selecting an over the counter orthotic if that is appropriate for your condition. FLAT FEET? HEEL PAIN? WE HAVE A SOLUTION!